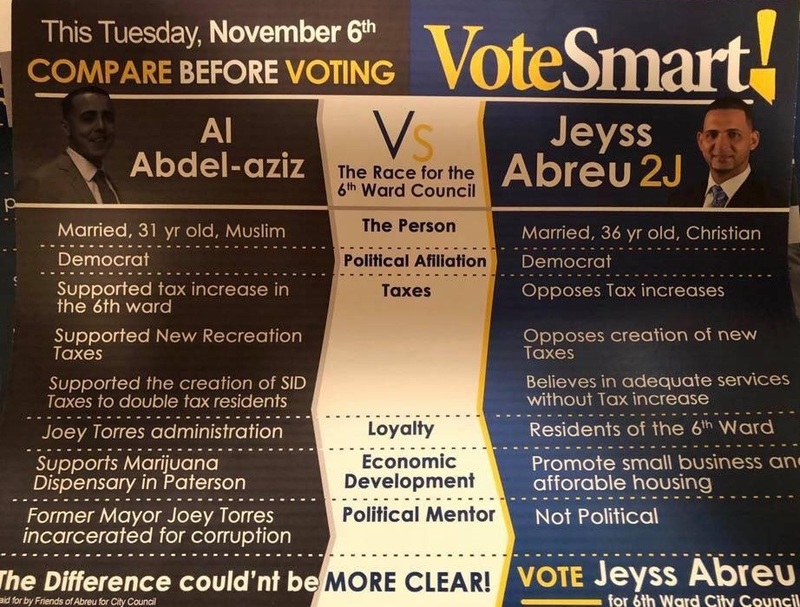 A flyer put out by challenger Jeyss Abreu’s campaign comparing him with incumbent Al Abdelaziz, including on each man’s religion, has stirred criticism. Abreu’s flier lists him as a Christian and Abdelaziz as a Muslim. Some of Abdelaziz’s supporters have denounced the flyer as divisive. Abreu’s campaign flier comparing himself and his opponent on religion. Abdelaziz’s face on the flier is black and white while Abreu’s is in full color, noted the incumbent. Abreu said he went to school with Muslims. He said his ad was not intended to offend anyone. “They want to victimize him. He doesn’t want people to focus on what the mailer is saying,” said Abreu speaking of his opponent. The flier lists both men as Democrats. It says Abreu opposes tax increases while Abdelaziz favors them. It tries to connect Abdelaziz with disgraced former mayor Jose “Joey” Torres. Torres had campaigned for Abdelaziz two years ago to oust then-councilman and his arch rival Andre Sayegh. Torres’ plan failed. 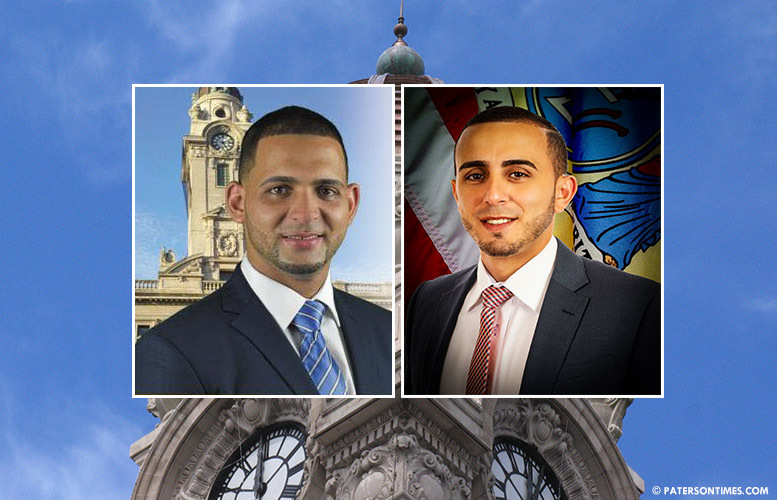 Sayegh won the mayor’s seat in May and has endorsed Abdelaziz for his old seat. Furthermore, the flyer says Abdelaziz’s economic development plan is to have a marijuana dispensary in Paterson while Abreu’s plan is to promote small business and affordable housing. Sayegh supports locating a marijuana dispensary in the Lackawanna neighborhood in the 2nd Ward. Abdelaziz has said he favors making the city more business friendly. Abdelaziz said Abreu is borrowing a page from president Donald Trumps’ campaign book with his divisive flier. “That’s a lie. That’s not what in trying to do,” said Abreu. He said he is not trying to divide people with his flier. The 6th Ward continues to see a building boom led by Muslims. Abreu recognized Muslims as a key constituency in the 6th Ward that he could not afford to offend days before Tuesday’s election. “Muslim people are very smart. They know that’s not what’s being targeted,” said Abreu. Absolutely shameless and disgusting . This guy and his whole campaign team are stupid . He’s living in past with Joey torres still. It’s 2018…. Him and his boy Alex haven’t won an election since 2014 . You guys need to start doing your Hw . He didn’t even know what’s makes the sixth ward !! A for effort though …..